OfficeTime is a basic yet useful time tracking and invoicing application that allows you to gather time spent on a project using your Mac or an iOS device. Once collected you can easily sync data between devices and then invoice your customers. The app also offers customizable reporting tools and allows you to export your billing data so you can import it into other applications. Like most programs of this type, to get off on the right foot OfficeTime requires a bit of basic setup before you can put the app to work. With OfficeTime this is a matter of creating categories and projects and setting hourly rates. 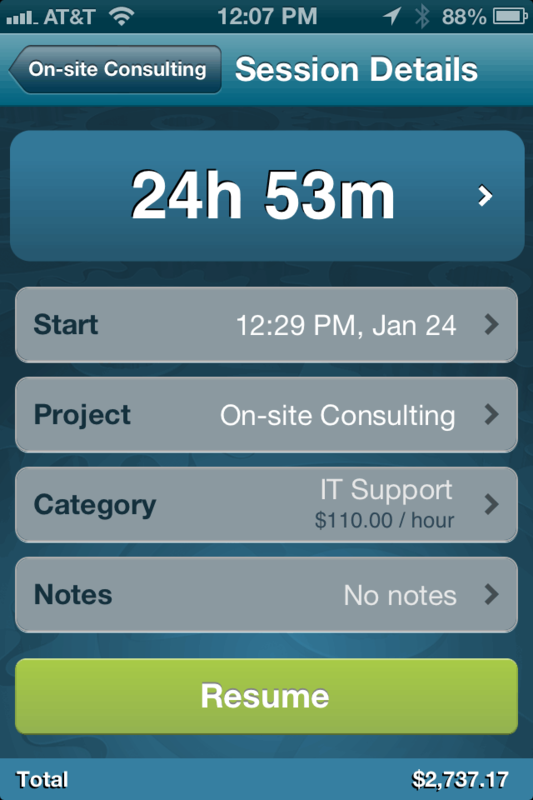 OfficeTime uses Projects as a way to group your work and Categories to store hourly rate information. When you set up a new project you give it a name and an ID, link it to a specific client, choose a default category, and then start timing your project. You also have the option to have a record of your timed sessions appear in Apple’s Calendar app. OfficeTime offers a number of options for switching between projects and stopping or starting timing sessions. A small button bar with a play button appears at the top of OfficeTime’s main window. A menu on the right-hand side of this bar displays your current project and can be used to quickly add, edit, or switch between existing projects. If you haven’t started a session for the day on a project, pressing the spacebar automatically creates a new timing session and starts timing. In addition, you have the option of adding a Menu Extra to your Mac’s menu bar, which also makes it easy for you to start, stop, or pause timers and switch between projects. OfficeTime ships with a small set of predefined categories, enough to give an idea of how to use them, and you can edit or add categories as you see fit. Categories are used to define the type of work you are doing for each timed session and each category can have a unique hourly rate. So if you charge less for time spent on the telephone than you do for time spent at a job site, you can create separate categories for each of those events and then quickly adjust the amount you bill your customers by changing its category. Categories for each timing session can be changed at any time and the dollar amount will be updated to reflect the rate of the newly selected category. When you start a timed session OfficeTime uses the category you’ve defined as the default for your currently selected project. If you haven’t selected a default category OfficeTime uses the program’s default category called—wait for it—No Category. This designation can be changed, which I did almost immediately by labeling it Unassigned, and, like every other category, it can have an associated hourly rate. OfficeTime allows you to use the Contacts app to get add contacts to an invoice, but I found this feature a bit clunky. To add existing contacts to an invoice you use a Copy from Address Book menu that appears in the Invoice generator. This menu presents you with a list of all contacts in your Contacts app, but isn’t searchable. You can type the first few letters of a contact’s name, which may put you in close proximity to the contact you want. While this was a hassle, it wasn’t impossible to overcome. What was impossible was locating contacts whose card contained both a name and a business name. Adding a business name removed the contact from the list leaving only the business name. If you have more than one contact from a single company this feature simply doesn’t work. So, if you want to use this feature and you have more than one contact from the same company in your address book, you will need to remove the company name from all of those contacts. OfficeTime’s reporting functions are rudimentary but useful. You have a number of options for displaying specific information. For example, you can report individually on specific projects, categories, or employees; or you can create reports that display selections of each of those options. For example, it’s possible for you to report how much time one employee spent on the phone for a specific project. The report screen updates dynamically as you change filters and displays a list of timing sessions and a graph for your currently selected criteria. Mobile OfficeTime: The OfficeTime iOS app lets you collect data in the field and synchronize it with the Mac app for invoicing when you get home. For invoicing, OfficeTime offers a TextEdit-based template that you can easily customize to suit your needs. Each invoice contains two pages, the first, which is a bill and a second which contains detailed information about what your customer is being billed for. While OfficeTime doesn’t offer the elegant invoices available in program’s such as Marketcircle’s Billings app, I found editing and updating OfficeTime’s TextEdit-based invoices to be very easy. The $8 OfficeTime for iOS app works well as a standalone time tracking tool, but it’s of more use as an adjunct to the desktop application. Using the app you can track time and expense information in the field and then sync that information with your Mac. What the iOS app can’t do is invoicing. That job is left to the desktop app, which is why you can’t use OfficeTime for iOS as a standalone time tracking and billing app. OfficeTime is good, but it doesn’t quite rise to the level of similar apps such as Marketcircle’s Billings, an app that costs less but which offers more features and capabilities. That said, OfficeTime is a great foundation for what has potential to be a great time billing app.